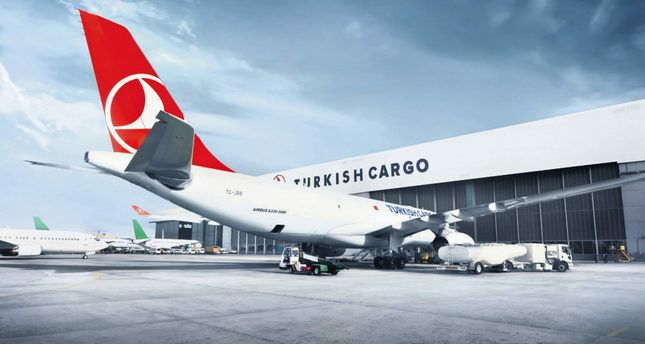 Turkish Cargo has ambitious plans for North America, supported by an aggressive marketing strategy in a lucrative market that has staged a strong economic recovery, and according to logistics experts at the recent Transport/Logistics 2015 Fair in Munich, is expected to attract the attention of cargo carriers from around the world. Turkish Cargo, which is building up a global network of cargo operations, began operating a weekly freighter service to Chicago in April 2015. "This all-cargo weekly flight will further boost our already substantial cargo capacity on our multiple passenger flights to cities in both the United States and Canada," said Turkish Cargo Vice President for Cargo Marketing and Sales Halit Anlatan in an interview with Daily Sabah at the Munich Transport/Logistics 2015 Fair. Anlatan confirmed that the airline is launching a service to Miami starting Oct. 25. These Miami flights will operate seven times a week in both directions. The carrier will then be serving eight destinations in the U.S. - besides new Chicago and Miami, it flies to New York, Boston, Washington, Huston, Los Angeles and San Francisco. Giving an overview of the carrier's global network, Anlatan pointed out that Turkish Cargo will maintain a presence at more than 265 destinations including 50 freighter destinations in 109 countries through its all-cargo freighters and its passenger aircraft, which transport belly-hold cargo. According to Anlatan, Turkish Cargo has a fleet of 10 freighters - seven A330F and three A310F. The carrier has placed an order for three more freighters, two of which will be delivered in 2016 and one in 2017. The company has built an intercontinental service to the U.S., transporting cargo via the Far East and Europe. "Our focus in the past was on Middle Eastern and African countries, but we are now also going to tap opportunities in the U.S. market," Anlatan said. As the economies of the Asia-Pacific region continue to grow at impressive rates, the cargo carrier is also intensifying efforts to get a larger slice of the market in this region. It is eyeing Vietnam, for example, for shipments of electronics and textiles, besides building up a presence or increasing it in places such as Dakar, Lahore Addis Ababa and the Congo Republic. The cargo carrier uses the Interline/Special Prorate Agreement (SPA) in cooperation with other airlines to expand its network, thus offering more routing options to its business partners and customers. The carrier maintains SPA arrangements with some 75 airlines and hopes the synergies resulting from this arrangement will open up new markets for customers. Turkish Cargo maintains SPA agreements for destinations such as Melbourne, Perth and Sydney, Auckland and several capital cities in Latin America and Africa. "Turkish Cargo can also accept cargo for many destinations in the Far East via Interline agreements. The interline agreements are, particularly, useful for new destinations where Turkish Airline does not have any flights," he said. According to Anlatan, Turkish Cargo has SPA arrangements with American Airlines and United Airline. The interline arrangement helps partners join forces to generate synergies and align with each other "to create a win-win situation." Though the volume handled by Turkish Cargo is still short of the volumes handled by other big cargo carriers, Anlatan said, "We are steadily working to get a larger share of the global market." The company's volume reached nearly 700,000 tons in 2014, up 20 percent over the previous year. "We are upbeat about the global air-cargo trade," he said at the at the Munich show, where Turkish Cargo's pavilion attracted "far too many visitors, surpassing our expectations, and we also got more business than during the 2013 event." Like many cargo carriers that operate to and from Europe, the depreciation of the euro had a major impact on imports into eurozone member countries, but this has been compensated for with an increase in export traffic from this region to other markets, particularly the U.S. "Yes, euro depreciation did affect our traffic, but the currency is adjusting and shows less volatility today," Anlatan said. Turkish Cargo also sees opportunities by building up its existing strengths in transporting niche segments, such as perishable foods and pharmaceutical products, live animals, etc. Anlatan said that the carrier had built up a good reputation in handling transport of all kinds of animals, including house pets and wild animals. Both Turkish Cargo and Turkish Airlines are expected to play an important role in the realization of Turkey's so-called "2023 Vision." As Turkey celebrates in 2023 the 100th anniversary of the founding of the Republic in 1923, the government has drawn an ambitious plan to mark this anniversary with huge projects. With the government setting a lofty export target of $500 billion by 2023 - the country's current exports amount to $160 billion - all the country's agencies are being encouraged to join forces to work toward achieving this goal. Whether this target is achievable is another thing. Much will depend on the global supply-and-demand situation. For Turkish Cargo, the volume target will be 3 million tons by 2023. Asked if the carrier could achieve this target, Anlatan said, "We are going to try very hard." But the carrier also has an equally ambitious plan to modernize its aircraft fleet, both freighters and passenger aircraft. "We intend to buy 450 aircraft, both passenger and cargo, by 2023. The fleet size in 2015 consists of 272 aircraft, including 10 freighters. We now have 58 wide-bodied aircraft and will get 12 more by the end of the year. Also in the cards is the construction of the new airport, which, according to Anlatan, will be three times bigger than the present international airport. "It will have a 150 million passenger capacity a year and a six million ton cargo capacity by 2023. The government has earmarked the equivalent of some 20 billion euros for the project," he said. The new Istanbul airport is being handled by five consortia. "As per schedule, the airport should be ready by 2018 when it will, initially, have a 90 million passenger capacity with three runways. The capacity will be raised to 150 million passengers by 2023," Anlatan said. The new airport will be 35 kilometers from the center of Istanbul and will replace Atatürk Airport, creating extra capacity to support the growth of Turkish Airlines' operations.